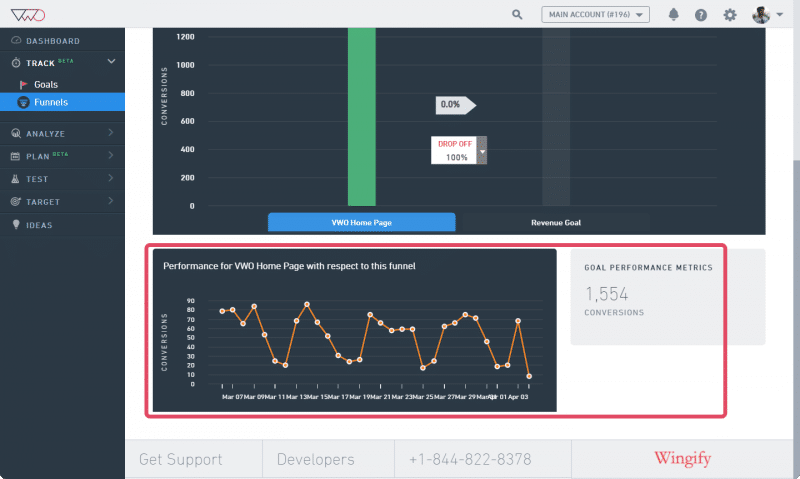 A funnel report displays all visitor data collected for the funnel, which includes the number of visitors, conversion rates, and the overall performance of the goal. On the Track dashboard, select the Funnels tab. 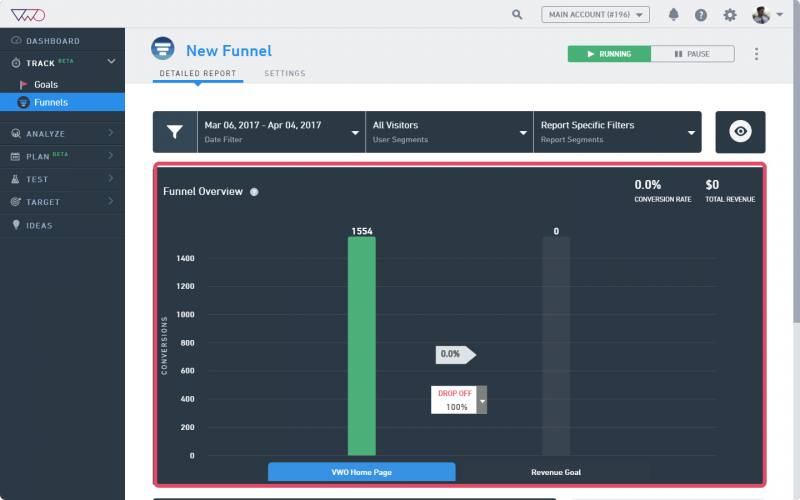 From the list of funnels displayed, select the one for which you want to view the report. Click the Detailed Report tab on the funnel summary page. The funnel report is divided into four sections—Filters, Funnel Overview chart, Goal Performance Metrics, and Performance on the same page with respect to the funnel. You can filter the funnel reports based on the dates and segments, if you have enabled the segmentation option for the goal. Select the date range for which you want to view the reports and click Apply. By default, the report displays for data for last 30 days. Yesterday: View yesterday’s funnel data. Today: View today’s funnel data. Select the segment for which you want to view the funnel report and click Apply. The funnel overview chart is filtered to display the relevant data after applying a particular segment. To learn about enabling report segmentation, click here. Funnel Trigger Time (Day of Week) – View funnel data for specific days of the week. Funnel Trigger Time (Hour of Day) – View funnel data for specific hours of the day. Funnel Revenue – (for funnels with revenue goals) filter report by revenue value. By default, the Funnel Overview chart displays the conversion rate data for the last two weeks. If you have applied the date or segment filter, the corresponding data is displayed in this chart. The drop-off percentage value indicates the percentage of the visitors who did not proceed to the next goal in the funnel. Displays the total number of goal conversions in the funnel. Displays the day-wise report of the conversions pertaining to the funnel. PRO-TIP Goals in a funnel are tracked in sequence. For example, unless say Goal 1 is triggered, goal 2 will not be tracked, and so on. You must ensure that the goals in the funnel are in correct flow and sequence for it to work effectively.